Applications for assignment to Marine Corps family housing (DD form 1746) need to be given to the Family Housing Office on Tarawa Terrace, Building TT-43, as soon as a military sponsor knows of an upcoming permanent change of station or within 30-working days of reporting for duty. If planning to live off base, military sponsors must report to the family housing office prior to renting, leasing or purchasing a home. 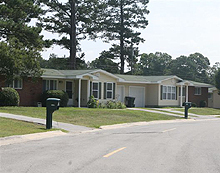 The Family Housing Office maintains listings of available off-base rentals and sales.